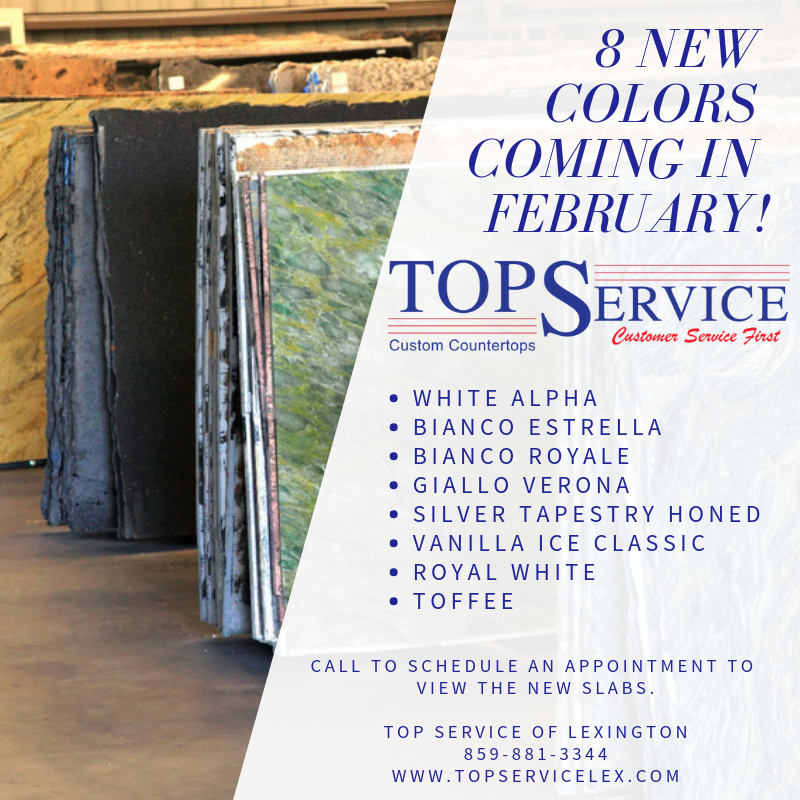 Top Service of Lexington Countertops is a manufacturer of Granite, Quartz, Solid Surface and Laminate custom countertops. The company was founded July, 2001 in Nicholasville, KY. We offer Quartz from Silestone, Caesarstone, Hanstone, Viatera. Solid Surface brands include Corian and Livingstone. Laminate brands include Formica and Wilsonart. We have over 500 samples of countertop surface materials to choose from in our showroom. We service Nicholasville, Lexington, Louisville, Richmond, Frankfort, Georgetown and Winchester, KY. Please contact us about your custom designed countertop or request a quote online. We take pride in providing custom solutions for each client, and look forward to working with you. "We would like to take this opportunity to thank you for the exemplary service we received from you during the repair of our kitchen countertops. Your representatives, Steve and Curt were thorough and extremely professional during this process. Their attention to detail is what makes customers like us appreciate your business and refer you to others. We wish you nothing but the best and look forward to working with you in the future. Thanks again." - Robert & Donna F.
"I want to thank you all for the way you took care of us to correct our concerns. There doesn't seem to be many companies that stand behind their work/products and ensure customer satisfaction anymore. And you all did just that! We have already recommended you to a couple friends. If we have any further countertop needs in the future, we wouldn't call anyone else but you! We worked with many of you through this process ... everyone was very professional and pleasant to work with, but an extra thanks to Paul and Josh, you this through to completion and ensured we were completely satisfied and I thank you for that!" - Krista S.
"When I was at your store, I noted the Brag Board. Well here's some more bragging for your board. When I needed a new counter top, my brother, Allen told me about your company, Top Service of Lexington. As soon as I walked in, Ida was willing to work on whatever I needed. Then Ida directed me to Josh who was most helpful in showing me what was available in the showroom and the outside inventory, even on a cold day in February. After another visit, we set up a time to measure the counter. TJ arrived at the arranged time to make the template. Then Scotty and David arrived at the arranged time with the counter piece and installed the top in a professional, timely manner. Thank you for helping me bring new life to my old kitchen." - Karen B. During the recent remodel at our home we have met many new people and had many services. Your service has truly been a blessing; prompt service and clean up. Thank you." - Donald & Janet L.
"Thank you for a job well done. I appreciated your punctuality and your professionalism. You and your workers are to be commended for their attitudes and abilities." - Bonnie M.
"Thanks again for your consideration with regard to our kitchen countertop. I truly appreciate your professional team and the quality of the workmanship. Please thank Lewis, Daniel & Scott for me. I will keep your card for our planned work in '05 and look forward to speaking with you soon. Best regards." -Louis P.
"Thanks for an excellent job. We are very happy" - Virgil K.
"I wanted you to know I am so pleased with the tops and the professional manner this entire process was; from working up the price to Lewis making the templates to the fellows tearing out and installing. I am so pleased and will certainly recommend Top Service in the future." - Pat R.
"Thank you! Thank you! Thank you! Your terrific! Thanks to your staff who measured the template and to the young men who installed the countertop. They did a top notch job on my mom’s countertop. We appreciate it!" - John and Peggy A..